AutoTURN comes in 3 choices for all types of modeling and design check requirements. Pro, standard and lite versions give you everything you need to get your projects done on time and under budget. Model, analyze, and visualize vehicle turning simulations and swept path all in a 3D environment. The leading vehicle swept path analysis and turn simulation software for engineers and designers. The low-cost, entry-level vehicle turn simulation software for modeling basic maneuvers. Delivering the latest technology to take on the most challenging design work, AutoTURN® is the vehicle swept path analysis and turn simulation software of choice for engineers, architects, and planners all around the world. 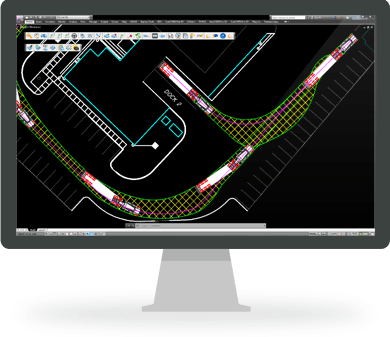 AutoTURN’s ‘heads up’ design method together with its intuitive features means you’re working much more efficiently. AutoTURN lets you evaluate different vehicle accessibility options in just minutes. And less time spent means lower project costs. We partner closely with the major developers of CAD platforms including: Autodesk®, Bentley® and Bricsys® to provide seamless integration.